"Now faith is confidence in what we hope for and assurance about what we do not see. This is what the ancients were commended for." Biblical faith is NOT blind acceptance of ridiculous events or belief in unsupported statements. Biblical faith is NOT a firm conviction to personal thoughts and ideas. 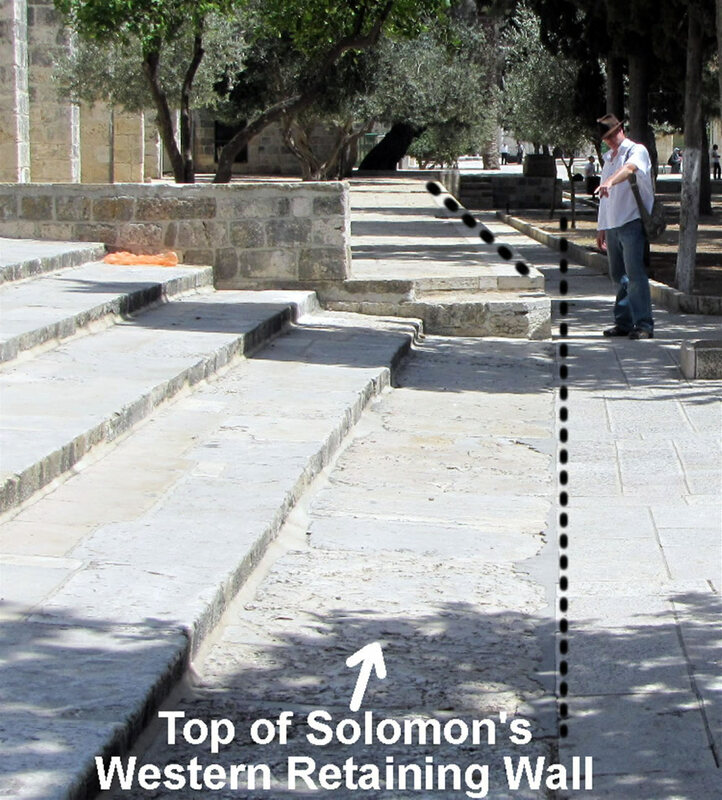 Biblical faith is based in defendable events and provable statements. God has always provided enough evidence for us to put our faith in something tangible: creation, fulfilled prophecy, miracles, Jesus ministry, the Word of God, etc. It is not how great you believe something that makes it true, but believing something that is true that makes your faith great. The value of the Christian faith is not in the one believing, but in the one who is believed in. Jesus, as he is revealed in the Word of God, is the object of our faith. “…and assurance (elenchos) about what we do not see.” Elenchos carries the basic idea of “proof,” “the test,” or “means of proof.” It continues to carry the objective sense, and rejects the subjective sense that would allow it to refer to manipulation according to personal whims and wishes. So, just like physical eye sight can see things that are in the physical realm, faith can see things that are in the spiritual realm. But, eye sight that claims to see things that are not really there would indicate some sort of mental illness or a defect in the physical organ of the eye. Likewise, faith that claims to see, trust or understand things that are not really true would indicate a spiritual illness or a deficiency in knowledge concerning the Word of Truth. When we know something that is unseen is true, then our faith (confidence) in that truth will produce thoughts, attitudes and actions. Faith in truth will produce confidence in that truth and assurance that the unseen is there. Knowing truth and putting faith in that truth is the transforming power of the Christian life. "Knowing that you do not heed his Word, why should I heed your explanation of it? The Tigris and Euphrates are easy to identify, but Gihon (meaning "to gush") and Pishon ("to spring up") are apparently gone. Since Genesis says Eden was in the east and the author must have been in the area of Canaan, Sinai or Midian it is believed that Eden was near the Persian Gulf or in northern Mesopotamia or Armenia. It is hard to know if anything from Eden remains since the world was destroyed and the surface of the earth reformed by Noah's Flood in Genesis 6. Paristemi (Gr) - Yield (Eng) - paristemi is Greek word made up of two words: histemi, which means "to place or stand," and param, which means "near." Paristemi means "to place near"
as "to place beside," "to present," "to stand beside." In 160 AD Justin Martyr identified the cave in Bethlehem where Jesus was born. This view was followed by Origin (250) and Eusebius. If this is the cave, or stable, of Jesus' birth it may have been connected to a house and used as a stable at that time. In 326 Constantine's mother, Helena, commissioned a church to be built over the cave. This church was dedicated on May 31, 339. Portions of this floor from the 330's can still be seen. Jerome lived there and translated the Latin Vulgate from the Hebrew and Greek. 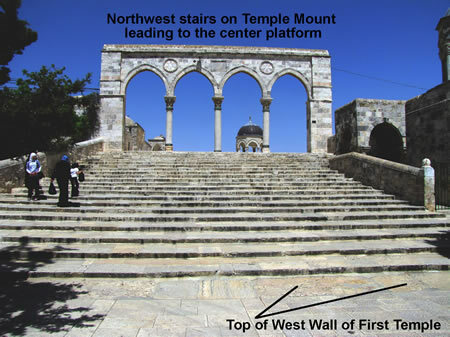 This is the stairs on the NW corner of the platform on the Temple Mount. 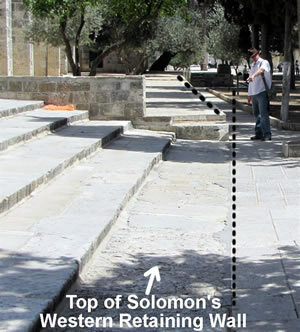 the bottom step appears to be the top course of the remains of Solomon's western wall, or the western retaining wall for the Temple Mount.